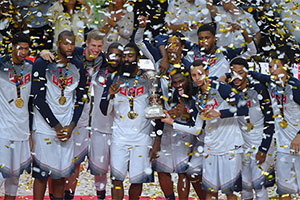 It may not have been the biggest surprise in sport, but that didn’t lessen the excitement or happiness for the Team USA players and coaching team after clinching the 2014 FIBA Basketball World Cup. They’ve been favourites since before a game was played in Spain, but this comes with its own pressure. We all know that the USA side, not even the strongest American side that could have played at the World Cup, was head and shoulders above the rest of the opposition at the tournament, but didn’t they show it. The margin of victory ensured that the American side were the first side to win all of their FIBA World Cup games by 20 points. This doesn’t mean that they are the best US national team ever, the era of the Dream Team still stands above this current squad, but it maybe shows the gulf in class between the current US side and their rivals. If Team USA did roll out all of the big guns, what would the final score have been? There is also the suggestion that the current US side were still playing within themselves. Their play at this World Cup has been littered with a number of slow starts, but this wasn’t the case in the final. 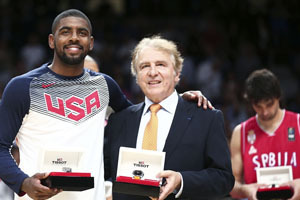 In less than half an hour, Team USA had reached the 100 point mark and Kyrie Irving notched up 26 points in just 25 minutes. This included 6 three point shots and there was no surprise that he was named the MVP for the 2014 World Cup. The player had shown a good level of consistency throughout the tournament and in the final, he was explosive at key moments, propelling Team USA to the win that everyone expected. Another player that also showed that they have what it takes to excel on the big stage is James Harden. He displayed an aggressive style of play, eventually grabbing 23 points from the game, helping USA to race away from their opponents. At the start, it looked as though Serbia was at least going to offer some form of resistance to what USA were offering. A 15-7 lead never looked as though it was going to last, but it did give hope that there was going to be a genuine content throughout the game. The USA defence had a few weak elements and clearly the Serbian team had carried out their homework effectively, pinpointing these weak spots. However, it didn’t take too long for USA to wake up to the situation they were in a slight bit of trouble, which led to DeMarcus Cousins coming in to replace Anthony Davis at centre. Cousins delivered his usual style of play, steadying the US defence while also managing to grab 11 points and offering 9 rebounds throughout the game. By the end of the first half, mainly thanks to Irving, the USA developed a 28 to 6 run and with respect to the game being a contest, it was all over. There was still an edge to the game, with the third quarter seeing a brawl take place, with the referee needing to get involved to separate the teams but the USA remained focus and saw the game out convincingly. Key Serbian players were Nikola Kalinic and Nemanja Bjelica, who both grabbed 18 points while Milos Teodosic picked up 10 points. Bogdan Bogdanovic, so often the key man throughout the tournament for Serbia, provided 15 points for his nation. With this win, USA don’t only take the Gold Medal back home, they have also booked their place at the 2016 Olympics, which will be a tournament that the side are even more interested in winning. The USA have now four major international tournaments in a row and you wouldn’t bet against them making it 5 in a row when they roll into Rio in two years’ time.